“The pain and suffering I have endured became the crucible God used to form my very nature.” Pastor Mike Reed. On September 25, 1965 Mike was born in Fort Sill, Oklahoma to parents John, an airline pilot for TWA and Rosemary Reed. Mike joined his 2 brothers: Greg who was 3 and David the oldest at 7 to complete the Reed family. After living in Texas for a short time the family finally settled into the home in Mission Viejo, California where Mike’s father still lives today. Mike’s parents were long time members of the Methodist church, and joined the local church soon after settling in to their new home. The boys continued to attend with their parents but had not yet made a commitment to Christ. As the boys grew they all developed in to exceptional athletes. Thirteen year old Greg was playing baseball and belonged to the Junior All American Football League. David now in High School also competed in both football and baseball. Mike at 10 was a talented baseball player. The family’s life revolved around the boys activities. Life was good. John, furloughed twice from his position with TWA as a pilot, decided this time to keep his part time sales position after he was reinstated again and began to fly only on the weekends. Things were finally looking up. He and Rosemary decided to keep the family on both insurance policies. In the background God was already at work. Then the hammer fell. In the summer of 1976 during a baseball game Mike became so weak he was unable to finish the game. Over weeks of testing Mike was diagnosed with Aplastic Anemia; the system which produces bone marrow was shutting down its production of blood platelets and white and red blood cells. The battle for Mike’s life was on, and his parents began to pray desperately for Gods intervention. The accepted treatment of mega doses of steroids, which attempt to shock the bone marrow in to producing blood, was begun. The treatments swelled Mike’s young body with pervasive edema, making him unrecognizable. Over the next 3 months Mike was given approximately 200 blood transfusions just to keep him alive. But the treatment failed. John and Rosemary were told by the doctors to let their son go. But, how could they refuse to give their son every chance to fight and live? They continued to pray. Then a life line from God appeared. A new procedure was available which had shown some limited success: bone marrow transplant. But the doctors at UCLA Hospital refused to proceed with the transplant, even after it was found that his brother Greg was a match. They had no confidence Mike would survive the procedure. Then beyond all hope a clinic was found that was experimenting with many new cancer treatments. Because John held health insurance policies from both of his jobs, Mike was accepted as a patient, and the experiments began. John and Rosemary clearly saw God’s hand at work. He was in control and had been preparing for just this circumstance to save their boy, even through John’s furloughs. Not one of the doctors treating Mike believed he would survive. Mike says they told him later that they would try anything new on him and then watch to see what would happen. In their eyes the situation was hopeless. Before the surgery, on his 11th birthday Mike was radiated for 4 hours, in order to prevent his system from rejecting the new marrow. The surgery was performed. After 10 prayer filled days his body began to produce blood, and the family knew that he would survive. The consequences of the transplant were severe and permanent. The formation of cataracts necessitated 6 eye operations over the next several years and destroyed his tear ducts. Mikes saliva glands no longer functioned. As a baby Mike was projected by his pediatrician to grow to a height of 6’1’’, he only reached 5’6 as an adult. Any chance of fathering a child was destroyed. Mike arrived home an emaciated and perpetually exhausted boy, sporting coke bottle glasses that made him look more like an old woman rather than a boy of 11. As he looked down the road of his life he wondered what was left to live for. Mike was absolutely convinced he would never experience the joys of love and marriage. Through it all Mike had not turned to Jesus. He says, “I didn’t know Jesus from Adam...It was all religion.” He knew God had saved him from physical death but he did not as yet know God personally. There was more pain and suffering to endure before he bowed the knee. The next several years were filled with loneliness and hopelessness. Too ill to attend Middle School on a regular basis Mike spent most of his days watching soap operas. Deep despair initiated thoughts of suicide. But God knew the pain that Michael was feeling, and He had plans for this hurting young man. Mike’s health suddenly took a dramatic turn-around and his body began to heal. He was able to attend High School on a regular basis. But there was more healing needed. Physical healing gives temporal happiness on earth, but spiritual healing is central to life eternal. And Mike had not turned to the God he knew had healed him physically. During the next several years, he turned to drug use, and filled his mind and heart with the lyrics of dark rock music. His soul continued to languish in darkness. Then finally in Mikes own words, “On July 6, 1982, God’s wonderful light came crashing into my darkness.” The day before he found himself reluctantly accepting an invitation from some “Jesus Freak” acquaintance to attend a Full Gospel Businessman’s meeting. He heard the message of the Gospel and opened this heart to embrace God’s love and forgiveness. In doing so, Mike experienced the greatest restoration of all; he was finally reconciled to the God he knew had healed his body. The changes in Mike’s life were swift and radical. On the way home from the meeting that night, Mike destroyed all the evil ungodly cassettes in his car. Ribbons of audiotape littered the car’s interior testifying to his new faith. When he arrived home, he immediately went to the “hiding place” in his room, grabbed his marijuana pipe, took it out into the night and cast it away forever, saying to the Lord “Jesus, I’m all yours!” No more did his mouth fill the air with ugliness and cursing, but with praises to his great and loving God! Mike immediately immersed himself in the things of God, attending every bible study and prayer meeting offered. Shortly following his conversion he sensed God’s call on his life for ministry. Two weeks later Mike was on the streets witnessing to his new faith. Although physically Mike was not the man that God had fashioned originally, he was now a mighty warrior of the living God, wielding the sword of the spirit for Jesus and His Kingdom! Over the next five years, Mike served as the sound man for a church in Mission Viejo where he received guidance and instruction and grew tremendously in the Lord. He attended Vanguard University where he received a Bachelor of Arts degree in Biblical Studies. In 1985 Mike met Hannah, the girl of his dreams, and to his absolute amazement and joy at what God can do married her in 1988. They adopted Kaila and Shawna. Mike soon took a position as youth pastor at a church in Oceanside where he served for three more years and, finally, in October of 1989, joined the staff at Calvary Chapel of Oceanside. He was content. But unbeknownst to Mike and his family there were still battles to be fought. During a routine blood test needed for Mike to acquire a life insurance policy, it was discovered that he had contracted Hepatitis C from one of his many transfusions. A new trial was upon him, but this time his beloved wife and daughters were in danger of losing their husband and father. After attending an organ transplant informational meeting Mike and Hannah were all too aware of the bad news about organ transplants. There were 10 people waiting for every organ that became available. Hannah admits that at first she was in absolute shock and denial. She could not believe it was so terrible; it just couldn’t be as bad as the doctors were saying! She convinced herself that God would intervene in some unknown way, and Mike would not have to have a transplant, or maybe He would heal him. Or perhaps it would be years before he even needed a transplant. But after further tests all doubts were swept away: Mike was in great need of a new organ now, not later. Hannah had to accept the realities of the situation, and her mind whirled with fearful thoughts. How could she possibly make a living? Obviously Mike had been denied the life insurance, and with her limited education and lack of marketable job skills she could not possibly support the girls on her own. How would she face life without her husband? Hannah says that slowly the Lord began to work to replace her fears with His peace. A trusted friend called and asked if he could stop by and leave them with a verse that he believed the Lord meant for them. Of course he could. They read John 11:4, “When Jesus heard that, He said, “This sickness is not unto death, but for the glory of God, that the Son of God may be glorified through it.” Mike and Hannah were stunned. This was such a specific and absolute verse. Now they had a choice, to believe that this was a promise from God for them or it was not. They decided to take the word of the Lord for their own. Mike admits that he occasionally felt great fear, depression, and sorrow pressing on his mind and heart during the next several months. But he didn’t let those fears pitch a tent in his heart. He explains that he only allowed the feelings to visit, still convinced that God was in control of his life. Then suddenly a ray of hope emerged. A new surgical procedure was available for liver failure. A living donor has half of their healthy liver removed and placed in a recipient. The organ regenerates and grows to full size so both recipient and donor end up with a totally functioning healthy liver. This was too good to be true! But who would possibly be willing to take the chance. There were risks involved. The donors had to have a perfect liver with absolutely no damage. Tests were necessary to determine suitability. A young marine from the church asked to be considered, was tested but rejected by the doctors. Because Hannah’s’ sister was living with the Reeds at this time, the two met; fell in love and later married. Then a pastor friend of Mike’s stepped forward and through the testing was found to have a disease of the liver that would have taken his life. He was spared by treatment. Hannah and Mike began to realize that God was using this trial of faith to work out His good in the lives of others and their own. After Bob was found to be a suitable donor the surgery was scheduled. Mike and Bob would participate in the 25th living donor liver transplant in the history of medicine. The lobby of the hospital filled with friends and family praying for Mike and Bob, testified to the faithfulness of God. The surgery was completed successfully, but the trial was not over yet. Hannah, who has a natural horror of hospitals and is severely squeamish about blood, was given a gift that enabled her to minister to Mike following the surgery in a way that defied belief. She no longer experienced the fear and horror at the mere sight of blood. She knows without doubt that the grace of God to minister to Mike was given to her for just that time. 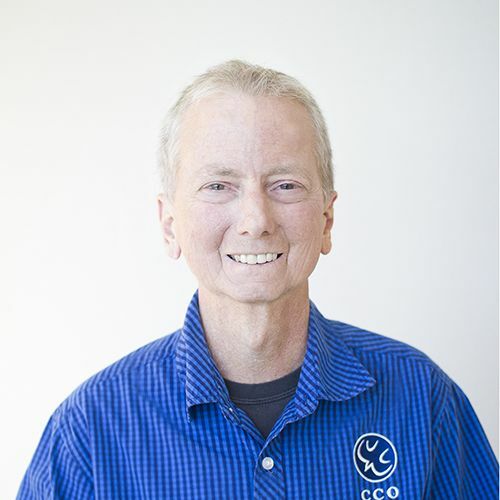 The people of Calvary Chapel Oceanside were also used mightily by the Lord to encourage Mike through his darkest hours. A large sign written by friends and family filled with words of love, and encouragement, prayer and scripture was brought to the hospital. It was hung on the wall where Mike could see it and he acknowledges that many times it was all that kept him sane during those first agonizing weeks. Finally Mike was well enough to return home. His convalescence took more time, but the peace of God once again reigned in his heart and mind.